This wonderful cycling trip along the Danube from Passau to Budapest combines unspoilt nature, hidden artistic treasures, charming monuments and peaceful cycling. Pedal through lowland forests, wide floodplains and follow the Danube River through three capital cities. Viennese culinary specialties - Try sweet treats like Sachertorte (type of chocolate cake). Your holiday starts in the German town of Passau, close to the Austrian border. After checking in to your hotel and picking up your bicycle from the local bike shop, the rest of the day is free to explore this pretty university town. Known as the 'City of Three Rivers', it is here that the Danube is joined by the Ilz and the Inn. We recommend a visit to St. Steven's Cathedral in the Old Town. This Baroque building is home to Europe's largest organ, with an impressive 17000 pipes. If you are lucky, you may time your visit with a lunchtime or evening concert. We also recommend walking up to Veste Oberhaus - the ancient fortress that dominates the city from the hilltop. Now a museum of history and folklore, spectacular panoramic views are afforded from the tower. Your bike will be delivered today or tomorrow morning and you will be required to sign an agreement of care upon receipt of the bike. This morning, there is time to explore more of Passau before jumping into the saddle to commence your journey to Schlogen. Cycling alongside the picturesque Danube, it is easy to see how this trail gained its reputation as one of Europe's most famous cycle paths. You cross the river by ferry from Engelhartszell to Uferhausl (ticket paid locally and not included in package) and from here cycle following the river up to Au, on the opposite bank to Schlogen. From here take the ferry across the river (ticket included). On arrival in Schlogen, a 30-minute walk will lead you to an impressive panoramic viewpoint over a bend in the Danube, where it alters course by almost 180 degrees. Your total cycling distance today is approximately 42 kilometres (120 metres ascent, 140 metres descent). A 20 kilometre ride along the shady riverbank takes you to the village of Auscach. Here, you may choose to visit the Fischermuseum, with its interesting exhibition on the Danube's historic fishing trade. Further along your route, there is the opportunity to swim in a couple of the picture-perfect lakes that you pass, so make sure you pack your swimming gear for this. Today's journey takes us to Linz. Although this is the second largest industrial town in Austria, it has a pretty city centre. We recommend a visit to the Neuer Dom - the largest cathedral in Austria which was only completed in 1924. Alternatively, you may choose to relax in the Hauptplatz, sampling the famous Linzertorte - the oldest known cake in the world. As you explore the town, look out for the house where Mozart composed his Symphony No. 36, otherwise known as the Linz Symphony. Your total cycling distance today is approximately 51 kilometres (130 metres ascent, 156 metres descent). Leaving Linz through the park along the Danube, you will continue your journey along the river. 18 kilometres into your route, you may choose to take a 10 kilometre detour to the Abbey of St. Florian (entrance ticket included) - an impressive example of Baroque architecture and art. After crossing the river by ferry (May to August) from Enns to Mauthausen (ferry ticket included), another option is to visit the sobering Mauthausen Memorial. Here you will find a well-presented visitor centre which details the atrocities that took place at this concentration camp. As one of the first Nazi 'death camps', conditions here were at the harshest end of the spectrum and survival was not expected. Your base for tonight is Perg - a small town near the river. Your total cycling distance today is approximately 40 kilometres (114 metres ascent, 139 metres descent) plus options to do an extra 4 kilometres to Enns, 6 kilometres to Mauthausen or 12 kilometres to St. Florian. We start today's ride through the Strudengau region and after a short while reach Grein, a quiet village on the river where we recommend a visit to Schloss Greinburg - a castle with stunning panoramic views, which also hosts an interesting navigation museum. From Grein you catch the ferry across to Uberfuhr (ferry ticket paid locally and not included in package). The next village you encounter along today's route is Ybbs. Just before the village you can choose between cycling across the river dam bridge and going directly onto Marbach where you will spend the night, or first cycling into Ybbs to visit the quirky bicycle museum where you can admire (and try out) many types of two-wheeled transport. Your total cycling distance today is approximately 64 kilometres (113 metres ascent, 149 metres descent). Further along the peaceful banks of the Danube the first place on today's ride is Melk, with its UNESCO-listed Baroque abbey - one of the largest in Europe. Benedictine monks have been living here since 1089. We also recommend visiting the abbey garden and the impressive library. Today, you cycle through the Wachau Valley, well-known for its picturesque rolling hills. This is the most famous wine region in Austria and, as you ride through the villages on your route, don't miss the chance stop off and sample some locally-produced vintages. Before your arrival at your night stop in Krems, you may choose to spend some time in glorious Durstein. This little town is a tourist haven, due to its picturesque setting and traditional architecture. The 12th century English king, Richard The Lionheart, was held prisoner here at Kuenringer Castle, the ruins of which still overlook the town. Your total cycling distance today is approximately 54 kilometres (215 metres ascent, 220 metres descent). Cycling today will lead you along the Danube to the historic city of Tulln, founded by the Romans. Your ride continues to Greifenstein, a suburb of Vienna where we may like to visit the castle. You continue the journey to Vienna by train (taking your bike with you). Your luggage will be delivered to the hotel in Vienna. The train leaves you at Westbahnhof station and from here you may choose to use public transport to head directly into town and explore. Vienna is packed full of fantastic sights and architecture. After your week of cycling, we think you definitely deserve a slice of chocolaty Sacher Torte, maybe even at the famous Hotel Sacher. Claiming to be the sole custodian of the original 19th century recipe, the hotel ensures that its formula remains a well-kept secret. Your total cycling distance today is approximately 61 kilometres (99 metres ascent, 114 metres descent). Today is left free for independent sightseeing. The city of Vienna remains a testament to the once immensely rich and powerful Habsburg dynasty and its architectural treasures are many, with impressive statues and public buildings at every turn, interspersed with tasteful gardens. You may choose just to spend a few hours walking around, soaking up the atmosphere, or you might take in a couple of the wonderful museums, or perhaps visit the world-renowned Schloss Schonbrunn, the enormous summer palace of the Habsburgs. Whichever you choose, Vienna will certainly provide a wonderful break from the saddle. The hotel is just 100 meters from the cycle path, once you have left the hotel start cycling in the metropolis of Vienna but not for long, soon you will find yourself in the greenness of the Donauauen National Park. Pass the Schonau and Orth castles then cycle on to the Habsburg Castle in Eckartsau. We recommend a detour to castle Hof, a magnificent castle which was built at the behest of the Austrian empress Maria Theresia; its impressive park and the gorgeous architectural monuments are definitely worth a visit. Continue cycling via Hainburg to the Slovakian capital, Bratislava. Spend the morning in Bratislava, wander through cobbled streets, and admire the Baroque architecture. Today's ride starts by leading you away from the capital along a cycling path and soon cross the Slovakian Hungarian border near Kunovo; via Dunasziget a village which was once located on an island in the middle of the Danube. Reach the small town of Mosonmagyarovar where you spend the night. Start by cycling across two of Mosonmagyarovars seventeen bridges on your way out of the town. Soon you pick up signs for the Eurovelo Route 6 and follow excellent cycle paths and quite country roads for most of the day. You will see yellow rapeseed fields bordered with deciduous trees. Stop to visit the village of Hedervar and its castle which has been converted to a hotel. Further on, partly along the idyllic Danube you arrive to Gyor, the 'metropolis' of west-Hungary, a dynamically developing city with a Baroque city centre. Once you have checked in to your hotel and left the bikes we suggest you visit the town hall which used to have a prison in the basement, the Diocesan Treasury to view its medieval manuscripts or try out one of the town's thermal baths. Not far out of Gyor follow an abandoned railway line for a while and then more country lanes past farmhouses and through forested land. Back on country roads you cross the Hungarian Slovakian border by cycling over a bridge on the Danube to the border village of Medvedov. Follow the beautiful Slovakian bank to the baroque city Cicov and further via Zlatna to the Slovakian/Hungarian city of Komarno/Komarom situated on both sides of the Danube connected by the Elisabeth Bridge. This morning you take the bridge back to the Hungarian part of the city; passing the Roman fort Kelemantia and isolated farming villages. Cross the well-known Gisela Bridge to Esztergom, you may wish to stop here and visit the cathedral. Follow the right bank of the Danube through more villages then cycle paths following signs to the ferry, cross the Danube then continue cycling on the right bank of the Danube to Nagymaros from where you catch the ferry to Visegrad. Explore by bike Szentendre-Island situated in a bend on the Danube and some 31km long. Continue by ferry to Szentendre-City which is about 20km from Budapest. Soon the Budapest skyline starts to come into view, and your ride that started in Vienna is nearing its end. Once you arrive to the Hungarian capital you are free to sightsee by bike or on foot. The city consists of two parts: Buda and Pest. Buda is the older, more graceful part, with cobbled streets and medieval buildings, whilst the latter is the modern business centre. We recommend visiting the Basilica of Saint Stephen and the Parliament buildings before crossing the Chain Bridge to the Castle District and Watertown. Here lie Buda's most ancient gems - Castle Hill with the Old Town, Fisherman's Bastion and the Royal Palace. The trip ends in Budapest this morning after breakfast. Austria has a variable climate with frequent changes of weather from day to day. Expect a contrast of warm summer days with the possibility of showers at any time. Germany has a variable climate with frequent changes of weather from day to day. Expect a contrast of warm summer days with the possibility of showers at any time. Summer days are generally quite hot and sunny with usually between 9-10 hours of sunshine daily. Winter days are usually quite windy and temperatures are regularly around or just below freezing. Night time temperatures can drop quite low in the hills whilst most rain falls in spring and early summer. Sudden rain showers can, however, occur at any time of the year. Summers are short in the mountains. July to August is the hottest period, when daytime temperatures average 20-22°C, though it may be much cooler in the early morning or late evening. During the winter, snow and ice is not uncommon, with snow generally starting in December and continuing to early February. Mountain weather is notoriously changeable and it can be cold at any time of year, so be prepared.. Early July is the best time for flowers. Day 1 - In Passau visit the Oberhaus Museum (www.oberhausmuseum.de). Entrance costs around 5 Euros. Day 2 - It is worth stopping at the Fisher Museum in Aschach (museum.aschach.at). Costs around 2.5 Euros. Day 3 - In Linz visit the Linzertorte Konditorei (www.linzertorte.at). Day 4 - Explore Sanct Florian abbey (en.wikipedia.org/wikit._Florian_Monastery). The entrance fee is included in the package. Alternatively stop at Mauthausen camp (http://en.mauthausen-memorial.at/). This costs around 5 Euros (guided tour best to book in advance). Day 5 - Today visit the Schloss Greinburg (www.schloss-greinburg.at). Entrance costs around 4 Euros. Day 6 - The Ybbs - Fahrrad Museum (www.ybbs.gv.at/kultur-tourismus/museen.html#c1511) costs around 4 Euros. Day 7 - On arrival into Vienna perhaps try the sightseeing wheel at Prater (http://www.wienerriesenrad.com/). The cost is around 9.50 Euros. Bring cycling gear such as quick drying cycle tops, padded cycle shorts and cycle gloves. The weather is changeable in this part of Europe so bring a mix of breathable light layers and warmer clothes. A waterproof cycle jacket is recommended in case of rain. A light windproof jacket is always useful. On all Explore cycle holidays we strongly recommend you bring along and wear your cycle helmet. In case of an accident resulting in personal injury, certain insurance policies are invalidated in cases where a helmet was not being worn. Cycle glasses to protect against dust, pollen and the sun, padded cycle gloves and a water bottle or water delivery system (e.g. camelback or platypus) are also useful. You may choose to bring your own gel seat cover for added comfort. Other items to consider bringing are a sunhat and sun cream, torch, earplugs and insect repellent. Please carry some or all of your cycling equipment e.g. helmet as part of your hand luggage. Other ferry crossings (days 2 and 4) and the train journey from Greifenstein to Vienna are included in the package and tickets will be supplied locally. GBP, USD and Euros cash are accepted at exchange offices and banks. All main towns and cities have ATM's for cash withdrawal. Travellers Cheques can be changed in main banks. GBP and USD are readily exchanged. ATMs are readily available throughout Germany. Most major credit cards are accepted, but ask first. Can be exchanged at banks and exchange shops. We'd recommend flights into Passau and return from Budapest, which are served by both budget (including Easyjet, Ryanair) and non-budget airlines (including British Airways) from multiple airports in the UK. At the start of your trip you can fly into Vienna or Linz Airports. There is an ICE direct train From Wien Hauptbahnhof train station in Vienna to Passau Hauptbahnhof. Trains every hour from 09.15 and the last train departs at 17.15 (duration 2.16hours). There are later trains with EN (Euro night train) or regional trains with connection stops. At the end of your trip you can fly back from Budapest. Germany: Visas are not required by UK, Australian, New Zealand, US and Canadian citizens. Other nationalities should consult their local embassy or consular office. Austria: Visas are not required by UK, Australian, New Zealand, US and Canadian citizens. Other nationalities should consult their local embassy or consular office. Nothing compulsory, but we recommend protection against tetanus, polio and hepatitis A. Tickborne encephalitis is recommended by some medical sources if travelling in certain areas of Europe, at specific times of the year. Please check the latest requirements with your travel clinic or doctor prior to departure. The above is not an exhaustive list. Further information regarding vaccinations and travel health advice can be found by following the NHS and NaTHNaC links at Explore Travel Health and from your local healthcare provider. Visa and vaccination requirements are subject to change and should be confirmed by you before travelling. Nothing compulsory, but we recommend protection against tetanus, polio and hepatitis A. Tick-borne encephalitis is recommended by some medical sources if travelling in certain areas of Europe, at specific times of the year. Please check the latest requirements with your travel clinic or doctor prior to departure. The above is not an exhaustive list. Further information regarding vaccinations and travel health advice can be found by following the NHS and NaTHNaC links at Explore Travel Health and from your local healthcare provider. Visa and vaccination requirements are subject to change and should be confirmed by you before travelling. 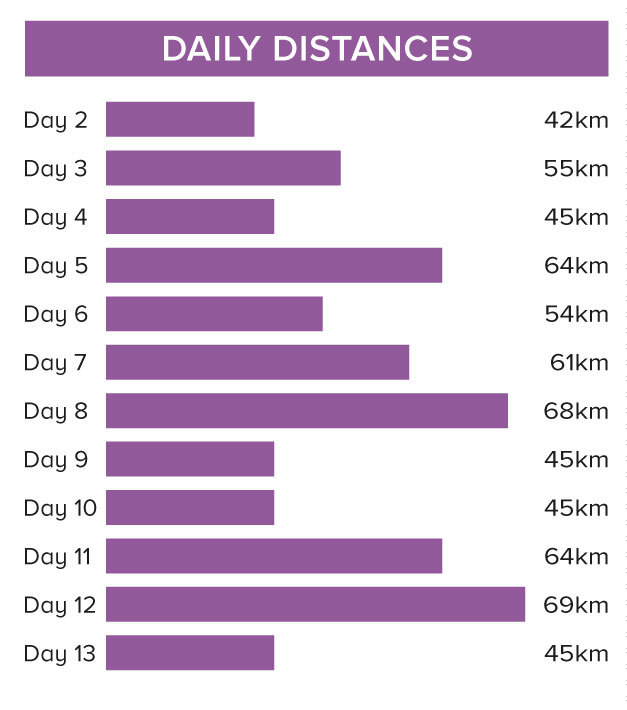 On this journey you cycle 657 km over 12 days, an average of 55 km per day. The terrain is almost completely flat. 95% of the route is on paved cycle paths without traffic and 5% on gravel tracks. We have graded the route as easy. 7 gear European city bike or 21 gear Hybrid bike. Your included bike is either a 7 gear European city bike (e.g. Schauff, Kettler or KTM) or a 21 gear Hybrid bike and will be the correct frame size for your height. Each bike is fitted with a lateral pannier bag as well as a map note holder on the handlebars. A lock is included. All you need to bring is your own helmet. Please note it is not possible to fit your own seat or pedals on the bikes. You will be required to sign an agreement of care upon receipt of the bike. Fri 26 Apr 2019 - Sun 28 Apr 2019 Your trip can depart anytime between the above dates. Contact us for triple room requests and solo traveller prices. Fri 3 May 2019 - Sun 5 May 2019 Your trip can depart anytime between the above dates. Contact us for triple room requests and solo traveller prices. Fri 10 May 2019 - Sun 12 May 2019 Your trip can depart anytime between the above dates. Contact us for triple room requests and solo traveller prices. Fri 17 May 2019 - Sun 19 May 2019 Your trip can depart anytime between the above dates. Contact us for triple room requests and solo traveller prices. Fri 24 May 2019 - Sun 26 May 2019 Your trip can depart anytime between the above dates. Contact us for triple room requests and solo traveller prices. Fri 31 May 2019 - Sun 2 Jun 2019 Your trip can depart anytime between the above dates. Contact us for triple room requests and solo traveller prices. Fri 7 Jun 2019 - Sun 9 Jun 2019 Your trip can depart anytime between the above dates. Contact us for triple room requests and solo traveller prices. Fri 14 Jun 2019 - Sun 16 Jun 2019 Your trip can depart anytime between the above dates. Contact us for triple room requests and solo traveller prices. Fri 21 Jun 2019 - Sun 23 Jun 2019 Your trip can depart anytime between the above dates. Contact us for triple room requests and solo traveller prices. Fri 28 Jun 2019 - Sun 30 Jun 2019 Your trip can depart anytime between the above dates. Contact us for triple room requests and solo traveller prices. Fri 5 Jul 2019 - Sun 7 Jul 2019 Your trip can depart anytime between the above dates. Contact us for triple room requests and solo traveller prices. Fri 12 Jul 2019 - Sun 14 Jul 2019 Your trip can depart anytime between the above dates. Contact us for triple room requests and solo traveller prices. Fri 19 Jul 2019 - Sun 21 Jul 2019 Your trip can depart anytime between the above dates. Contact us for triple room requests and solo traveller prices. Fri 26 Jul 2019 - Sun 28 Jul 2019 Your trip can depart anytime between the above dates. Contact us for triple room requests and solo traveller prices. Fri 2 Aug 2019 - Sun 4 Aug 2019 Your trip can depart anytime between the above dates. Contact us for triple room requests and solo traveller prices. Fri 9 Aug 2019 - Sun 11 Aug 2019 Your trip can depart anytime between the above dates. Contact us for triple room requests and solo traveller prices. Fri 16 Aug 2019 - Sun 18 Aug 2019 Your trip can depart anytime between the above dates. Contact us for triple room requests and solo traveller prices. Fri 23 Aug 2019 - Sun 25 Aug 2019 Your trip can depart anytime between the above dates. Contact us for triple room requests and solo traveller prices. Fri 30 Aug 2019 - Sun 1 Sep 2019 Your trip can depart anytime between the above dates. Contact us for triple room requests and solo traveller prices. Fri 6 Sep 2019 - Sun 8 Sep 2019 Your trip can depart anytime between the above dates. Contact us for triple room requests and solo traveller prices. Fri 13 Sep 2019 - Sun 15 Sep 2019 Your trip can depart anytime between the above dates. Contact us for triple room requests and solo traveller prices. Fri 20 Sep 2019 - Sun 22 Sep 2019 Your trip can depart anytime between the above dates. Contact us for triple room requests and solo traveller prices.